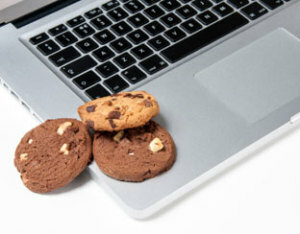 If you have ever spent any time on the Internet, you probably know about cookies. Cookies are little bits of code that are deposited into your Internet browser when you visit a website. They include information like which pages you visited, so that the next time you go to that website, the pages load faster. A lot of cookies are pretty harmless, but some of them can insert pieces of code that are unwanted, like programming that pushes advertisements or suggests content that you don’t want to see. Those are little monsters that can wreak havoc if you don’t clear them out of your system. In the same way, we all have cookies in our brains. These are bits of information that we carry around with us based on previous experiences. Like a computer, our minds unconsciously load in that data when we come across the same or similar people, places and events as we encountered in the past. Our browsing history in the world informs our present experiences. The problem is that some of those little cookie monsters have made their way into our thoughts, as well, and we need to clear them out if we’re going to function properly. As an example, I stored away a lot of cookies in my mind and my emotions based on my experiences as a young girl. My parents divorced when I was a toddler, and my father raised me as a single parent until he remarried when I was 11. He tried hard to take good care of me by providing me a safe home and a quality education, and he loved me very much. But he was also pretty far out of his element. See, my father had a short fuse when it came to his temper. He would seem to blow up for no reason. And, as a little girl, that meant I was walking on eggshells because I never knew what was going to set him off. I didn’t want to make daddy mad. Mad was loud. Loud was scary. Angry = scary. Years later, when I was a junior in college, I rented a house off campus with three other girls. One morning while I was eating breakfast, one of my roommates came storming downstairs to give me a piece of her mind. I don’t remember the topic—something to do with her right to have her boyfriend hang out at the house when she wasn’t there, I think—but I do remember that she was loud. Really loud. And suddenly, I was six years old again. I didn’t engage in the argument; I maintained a calm demeanor as she vented all over me for a good five minutes. But after she stormed out the front door, I turned into a quivering mass of Jell-O. I was literally shivering for the next hour, my teeth chattering as if the air were 12 degrees, because angry meant scary. My father had unwittingly deposited a cookie in my mind, and it triggered all the old code, overriding my later life experiences or adult reason. We all have those kinds of cookies, the tapes that play in our head that tell us who we are, how we are to behave, and what we are and are not capable of. Because of my upbringing and things I experienced when I was younger, I carried some very irrational fears into adulthood, along with unmerited feelings of shame. Although I am an accomplished woman in both my personal and professional life, I would find myself stricken with near paralyzing pangs of inadequacy at the most awkward times, ruining what should have been fun and exciting occasions for growth. Over the years, I have looked for opportunities to “clear the cache” in my mind and get rid of those unwanted cookies. Usually, that meant stepping outside of my comfort zone and facing the fear head on. In my 20s, one of those fears was talking on the phone. I absolutely dreaded calling people, especially strangers, for fear that I would say something wrong and sound stupid. My aversion to the telephone verged on a phobia. Although at the time I was virtually incapable of calling a taxi or ordering a pizza, I did not want fear to keep me from achieving my goals. I decided to take an internship in public relations, which required me to make phone calls every day. I literally used to write out every word of what I wanted to say on a yellow legal pad before dialing the phone, so I could steel myself for the conversation. The process was emotionally painful, but with repeated practice, the task became easier. I relied less and less on my self-invented script and was able to improvise more. Those skills served me in good stead years later, when I became a journalist and frequently had to arrange interviews by phone. Today, I can call strangers without breaking a sweat. I have also learned from my husband how to brighten the day of the person on the other end of the line through humor and a positive attitude, so that making phone calls is no longer something I dread, but an opportunity to be a blessing. If you are being held back by fear or self-defeating behaviors, I challenge you to kill the cookie monster. Root out those old tapes and bits of malicious code, and replace them with new information. Ephesians 2:10 says, “we are God’s handiwork, created in Christ Jesus to do good works, which God prepared in advance for us to do.” Believe God today that you are competent, capable, and perfectly made in the Creator’s eyes. Get those unwanted cookies out of your head, and be transformed by the renewal of your mind!